This is the sentence that made me open an article from a news source I never read. ‘As my 9-year-old daughter watched them pass, her forehead knitted, and then she looked up at me with solemn hazel eyes. “Mama, what is sin?” she asked. The merriment of the fair receded and I stared at her, my brain spinning with the magnitude of her question. By failing to teach my child the meaning of the word sin, had I somehow failed to give her a moral foundation? This is an excerpt from The New York Times article, Raising Children Without the Concept of Sin. Honestly, without love at the core of everything, we can become focused more on issues than people. If I’m honest, I can lose sight of the people behind the issues they stand upon. We are surrounded by broken hearts in need of truth wrapped in love. Our life experiences become a filter through which we see life. Had I been raised in the same environment described in this article, I can’t say I wouldn’t feel the same way about God and sin. Note the little ‘g’ use for God. Oh, the deception of the enemy on this precious child of God. Raised in a home that didn’t know God yet used Him as a form of fear and punishment. And what’s a child to do? Our natural inclination is to project our earthly father onto our Heavenly Father. No matter how good or heinous our earthly father is, that’s not God. One man in all humanity is a picture of God. Jesus. Perfect, spotless, righteous, kind, just, loving, tender, merciful. He alone is the only one who can give us a picture of the Father. I agree with her statement. Religion has nothing to do with goodness. The “religious” killed Jesus. Christianity is not a religion. It’s a relationship. Again I agree, religious brainwashing is hard to shake. So much evil has been birthed in the name of religion. Because someone proclaims to be a christian doesn’t make it so. At the same time, I have done and said things that misrepresent Christianity. Implanted deep in the heart of every human is a hunger and thirst for truth, goodness, and love. We were all created in the image of God with a heart designed to love Him and long for Him. That’s why we spend our lives searching for meaning and significance. When we finally encounter the God of the universe, we find our place. Right in His arms, the ones outstretched toward us since the beginning of time. God, too, is concerned with real-world concerns and injustice. So much so that He sent His only Son to the cross on our behalf. To right the wrongs and defeat evil and death once and for all. You know, I was once a girl focused on working my way to heaven too. I worked my entire life to be good enough. That was an impossible feat. At various points I’d throw my hands up and say, “It’s just too hard.” And I’d go my own way. At 23 I had an encounter with God. 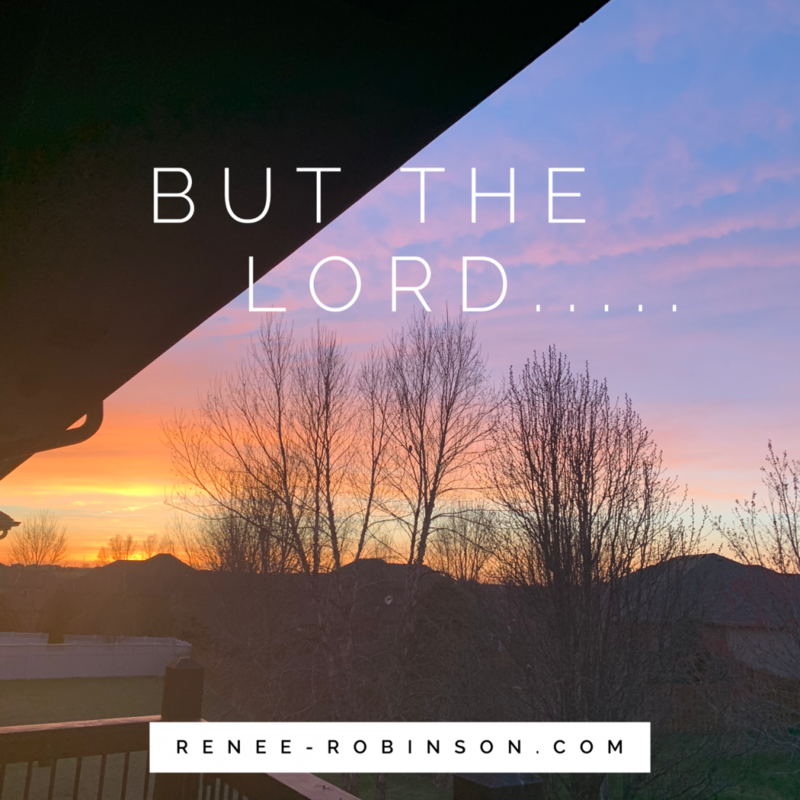 A switch flipped in my brain shining light on the darkness that surrounded my false beliefs of living a perfectly holy life to work my way to God. I remember saying, “That’s it, God! I get it now. It IS impossible for me to be good enough to make my way to heaven. That’s why you sent Jesus to die in my place.” A lifetime of the knowledge right before my very eyes that I never understood. It was a word I’d never understood, used in church circles by “good” people. Grace. What in the world did it mean? I thought I knew, but until that light bulb moment, that word lived in the dark of my understanding. This life isn’t the only life we’ll know. If so, what would be the point of it all? If it simply just ends and goes away. Why? There must be more. There is more. The author refers to an unproven hell, choosing instead to place her faith in her unproven belief that this life is all we’ll know. Both beliefs require a level of faith. She didn’t lose her faith. She simply took her once faith in a God and placed it her own ideas and thoughts. But I don’t fault her. The one I fault -Satan. The one who comes to steal, kill, and destroy. The one who is out fighting for souls. To blind the people into believing heaven and hell isn’t real is to win them to the darkness. A forever eternity void of all hope. None of us are born without a knowledge of sin in our souls. We all know. Deep down we know. While her daughter might not know the term and definition, inside she knows. It was the closing sentence that caught my breath. “An explanation of sin could wait.” It can’t wait. We aren’t promised our next breath. We don’t know the time or day that will be our last moment on this earth. And when we depart, life continues after. The choice is ours. Will we choose heaven or hell? The choosing happens now in this life. Once we depart this life, it’s too late. This New York Times article reflects the real beliefs of thousands and thousands of people. Would you join me today in praying for the ones who have believed the enemy’s lies? Let’s ask God to intersect our lives with these people who need to hear that God is not an invisible, vindictive God. Let’s wrap them in love and pour into them out of the overflow He’s poured into us. Ready to go deeper with God? To push back the dark? Illuminate is a 14 day devotion to help you focus on who God is as revealed by His Word. It’s the only way to counter the lies of this world- to know Him, His voice, His character. He loves you like crazy. It was gruesome, bloody, unfair. He was rejected by His own. His eyes find mine. Right now. In this moment. He wasn’t who they expected. It wasn’t how they imagined a Messiah. He didn’t fit their narrative. They had ideas of the kind of king they wanted. It wasn’t Jesus. Yet, He was and is I Am. And this infuriated the religious leaders. “I am he,” Jesus said. (And Judas the traitor was standing there with them.) When Jesus said, “I am he,” they drew back and fell to the ground. The ones who claimed to know God didn’t know God at all. Today, I remember. I remember the sacrifice He made. The darkness couldn’t stay because the Light had come. God illuminated the darkness then and He illuminates today. When I remember who God is, it changes how I see what He does. May we begin the art of remembering who He really is. The world is working overtime to override what we know. So we make a choice to invest in remembrance. Today, I remember the sacrifice He made because God is love. Offering His only Son flowed out of who He is. He is love. He is just. He is holy. Remembering is changing me. It takes my eyes drawn into myself and points them up to Him. As I stand in awe of who He is, all my fears fade away, anxieties dissolve, insecurities vanish. He is infinitely more than I know. I want to know Him more. And I know I’m not alone. I know there are some of you just like me. You desire to know Him deeper. You want more of Him. So I’ve created a tool to help us learn to remember. It’s a daily practice of refocusing back on God. To His Word. I share stories and His Word. We reflect and contemplate. We pray. We seek. He changes us. He draws us close as we draw near to Him. He’s ready to do a new thing in you. Will you allow Him? Illuminate – Seeing God by the Light of His Word is a 14 day experience. It’s audio with transcript, slipped quietly into your inbox once a day for 14 days. It’s yours to keep, never expires. You can listen over and over again. I’ve included a sample from Day 6 – I Am. I pray it blesses you. 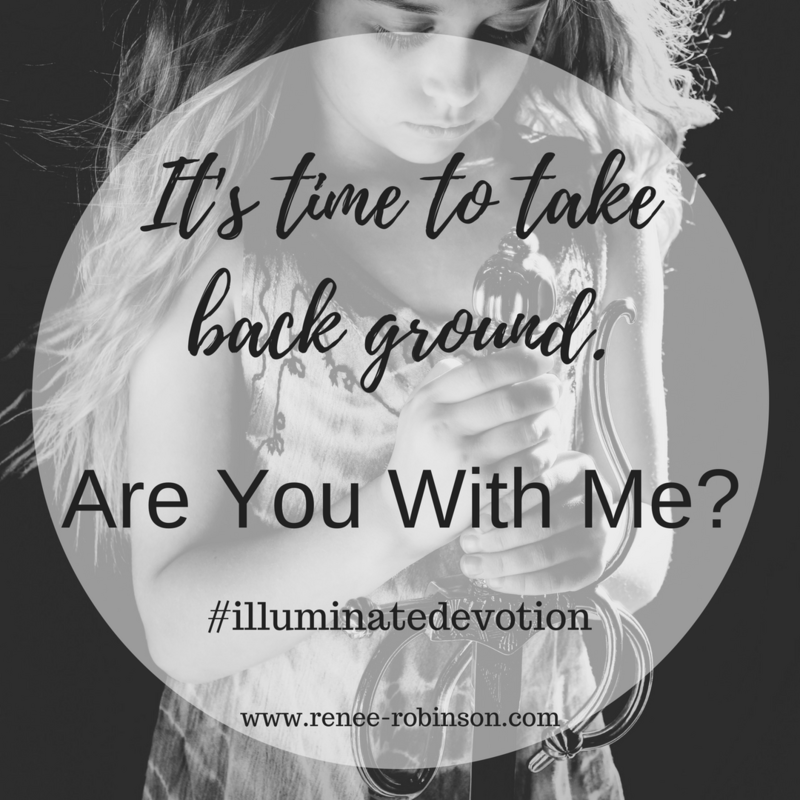 It’s Time To Take Back Ground – Are You With Me? The weight of that question laid over us like the blankets cocooning us against the howling Lake Michigan wind. Huddled like teens away at camp, the questions from deep within bounced back and forth between us. With tenderness we held the holiness of the ponderings leading us to the question we believe was God-breathed. Who is God? Really? Not the version the world creates. Not who others tell us He is. But who He is as revealed by Him! We know God. We walk with Him. But He is infinite and we forget. Or worse, we harbor lies deep in our souls that we don’t even know are there. Lies like God isn’t good all the time. Or I have to take care of myself because God might fail me. Or I need to prove myself because I have to earn God’s love. There are so many lies that bury themselves inside our hearts without us even realizing it. That is until we find ourselves in a situation that requires complete and total trust in God. And we have to go back to remembering who He is. When we focus there, everything begins to change. What if the answer to our biggest challenges in life is found by one simple practice or discipline? Actually, I now believe it is. my God illuminates my darkness. and with my God I can leap over a wall. Friend, it’s time to take a stand. Time to take back ground the enemy has taken from you. No longer will you allow him to bully you. No longer will he use fear tactics, depression, anxiety, or diagnosis. No longer will he use your pain as a weapon against you. No longer will he use your illness against you. No longer will he use your insecurity. Nope. He’s done. You know why? Because God is bigger. It’s a simple truth we know but forget to live into. For too long we’ve allowed the devil to speak too loudly. Why do we listen to him? Have we forgotten he’s a liar? The enemy tells us God’s not good. The enemy tells us God won’t catch us when we fall. God tells us He will never leave or forsake us. The enemy tells us to protect our hearts because no one is looking out for us. God tells us He bottles up our tears. The enemy tells us no one sees or understands. God tells us He’s numbered the hairs on our head. And the stars he calls by name. Yeah, He sees alright. Take that satan, you liar! God has been showing me for a year it’s time to go on the offense. Too often we wait to start fighting when the weight of the world feels it may crush us. So God woke me early one morning, only a few short weeks after I sat huddled like a teenager with my friend at a writer’s retreat. He woke me with His Presence and His Words. His Holy Spirit began to pour out over me, and I experienced a time with Him like nothing I’ve ever experienced before. And now I finally get to share it all with you. Do you find yourself facing problems, grief, difficult people or situations and feel it will swallow you right up? 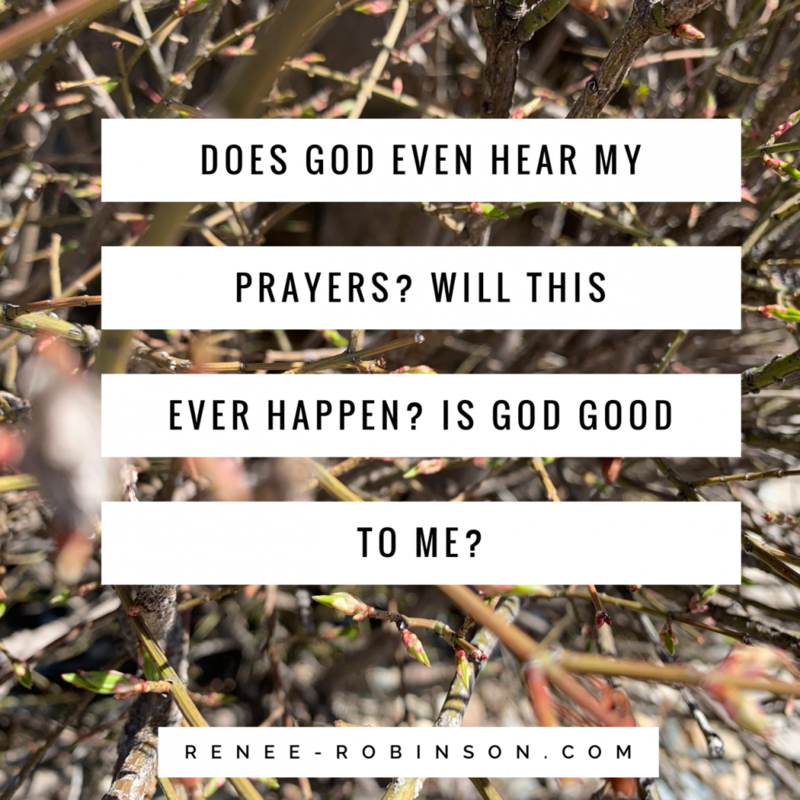 Do you wonder how others hear from God and you don’t? Do you simply need a heart renewal and revival? Are you hungry for that which sustains? You are not alone. It’s time to illuminate the darkness. I have written and created a devotion just for you. 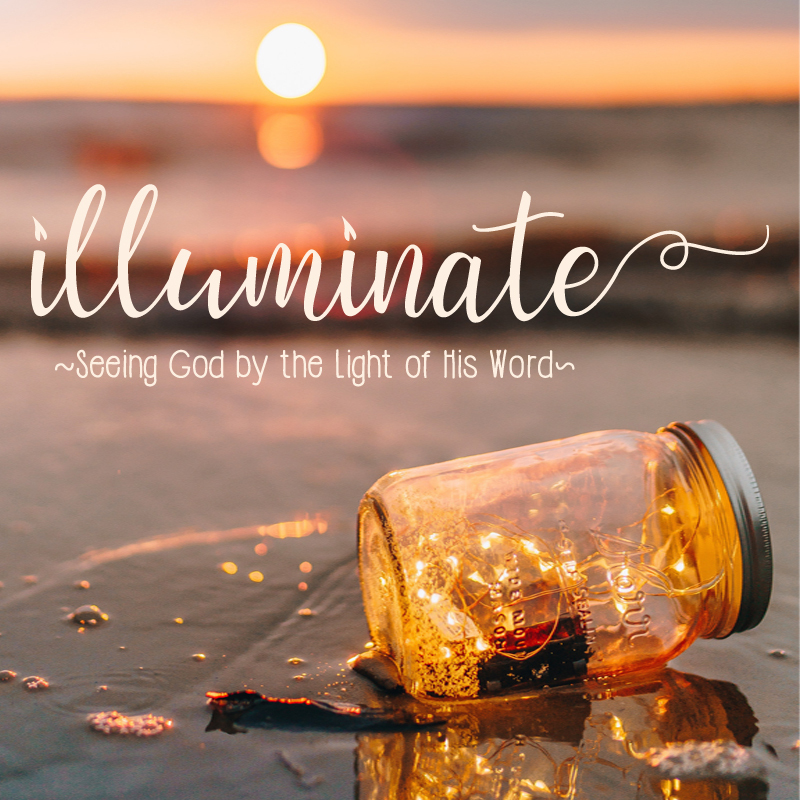 Illuminate – Seeing God by the Light of His Word is available for purchase here. Here’s a post with all the questions you might have. Or you can visit here for a video trailer and reviews. https://renee-robinson.com/wp-content/uploads/2018/03/Its-time-to-take-back-ground..png 1080 1080 Renee http://renee-robinson.com/wp-content/uploads/2017/08/ReneeGrey_03.png Renee2018-03-22 05:00:092018-03-22 11:20:39It's Time To Take Back Ground - Are You With Me? 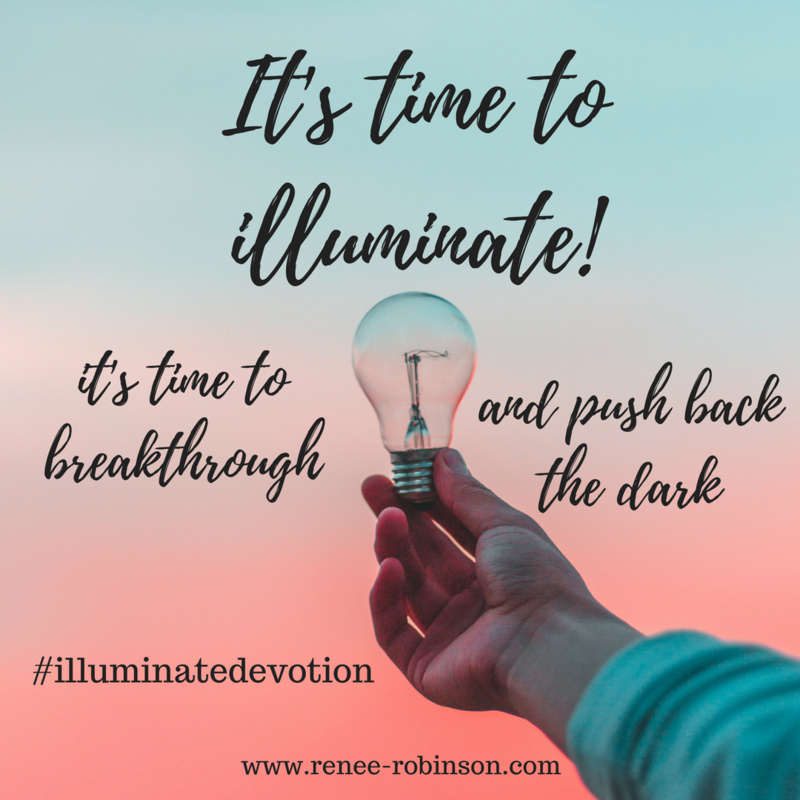 Are you ready for a breakthrough & ready to push back the dark? It’s time to illuminate! A 14 day, focused devotional experience centered on the character and heart of God. It’s for the christian who wants to experience God in a more intimate way. It’s for the person who is tired of seeing fears, anxieties, and problems as bigger than our God. It’s for the person who can’t find the time for traditional devotionals. It’s for the person who desperately needs a revival of the heart, a spiritual awakening from slumber, monotony, and staleness. 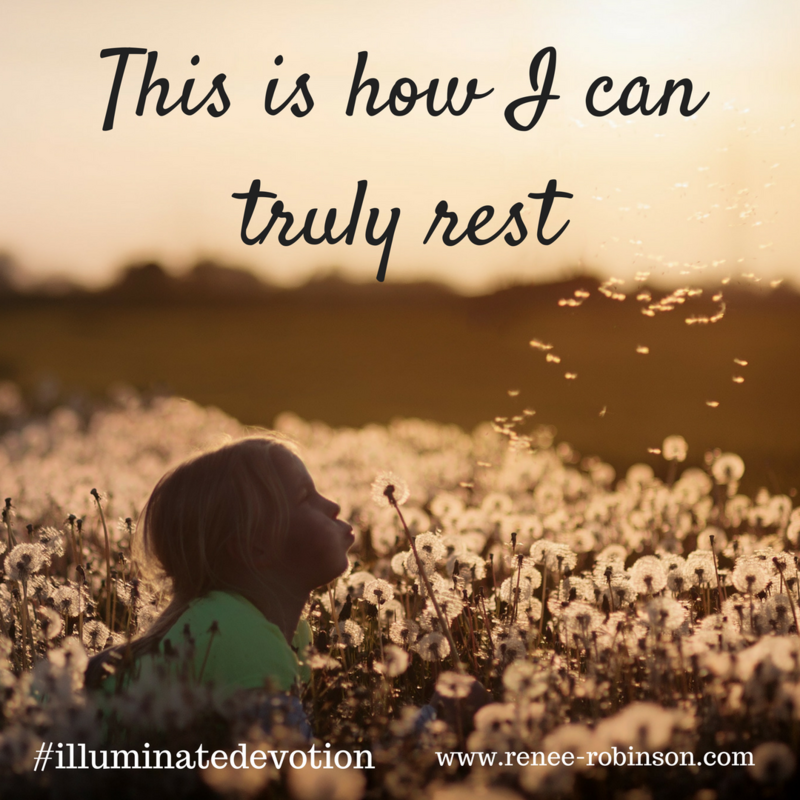 It’s for the person who feels overwhelmed by life, racing to keep up with the pack, and desperate to find a moment of rest and time to breathe again in order to see God clearly at work. It’s for the person who keeps saying, “Once I get here (or do this) then I can rest.” Yet, you find it’s a race with no end. It’s for the person with an insatiable hunger and thirst for the things of God. You can’t get enough of Him. You are ready for more and you know He’s infinitely more than you can fathom. So you have open palms and surrendered arms asking Him to bring more of Him to you. Because we all need to be reminded to remember. Because we want to begin a new discipline that is an art. The art and discipline of remembrance- who God is as revealed in His Word. Because you need a perspective shift. A tool to teach you to take your eyes off your problems and place them onto the One Who quiets the wind and the waves. Because writing it changed my life, and I want the same for you. 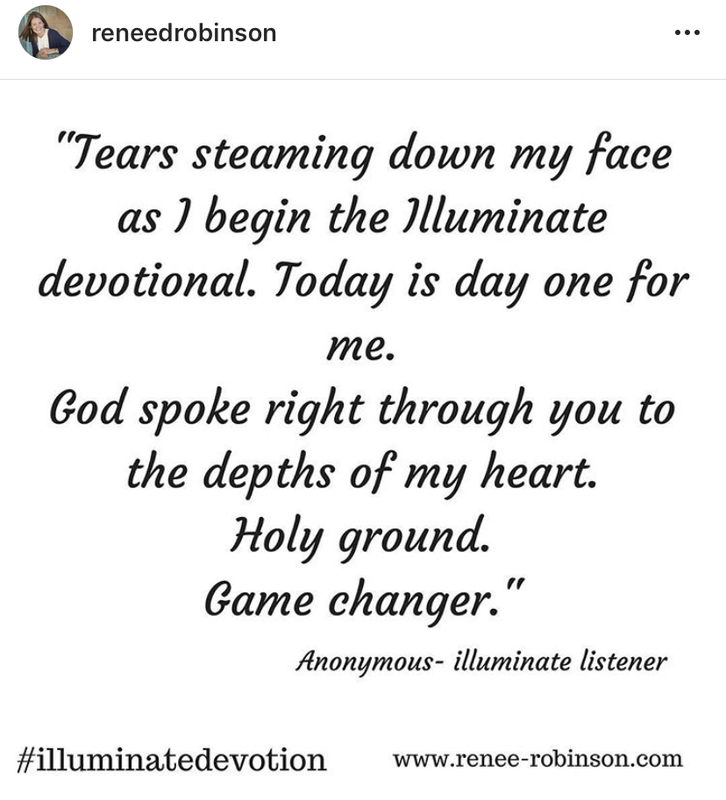 Click the picture on this post or visit www.renee-robinson.com/shop and select the Illuminate icon. Add Illuminate to your cart and follow the steps through checkout. Be sure to enter the email you want to receive the devotion to. After checking out, you will receive an email receipt. Within one hour of checking out you will receive your Day 1 email. In this email you will receive the audio link as well as the transcript link. To listen to the audio, simply click where it prompts you and the player will begin playing. Now sit back and let me gently and slowly read to you while soft music plays in the background. For the next 13 days, you will receive one email a day, slipped quietly into your inbox. Each day is approximately 10 minutes or less. I’m not good with technology. Will this be difficult? This is a simple to use process. You need a credit card and email address. Within approximately an hour of ordering, you will receive the email for Day 1. Each day following, you will receive the next day in your inbox. You can listen through your phone, computer, or ipad. You can listen through speakers or headphones. How long does it take for the Day 1 email to arrive? It arrives within the first hour of purchase. However, it frequently lands in junk, spam, or promotions. Be sure to check there if it doesn’t arrive to your inbox after purchase. 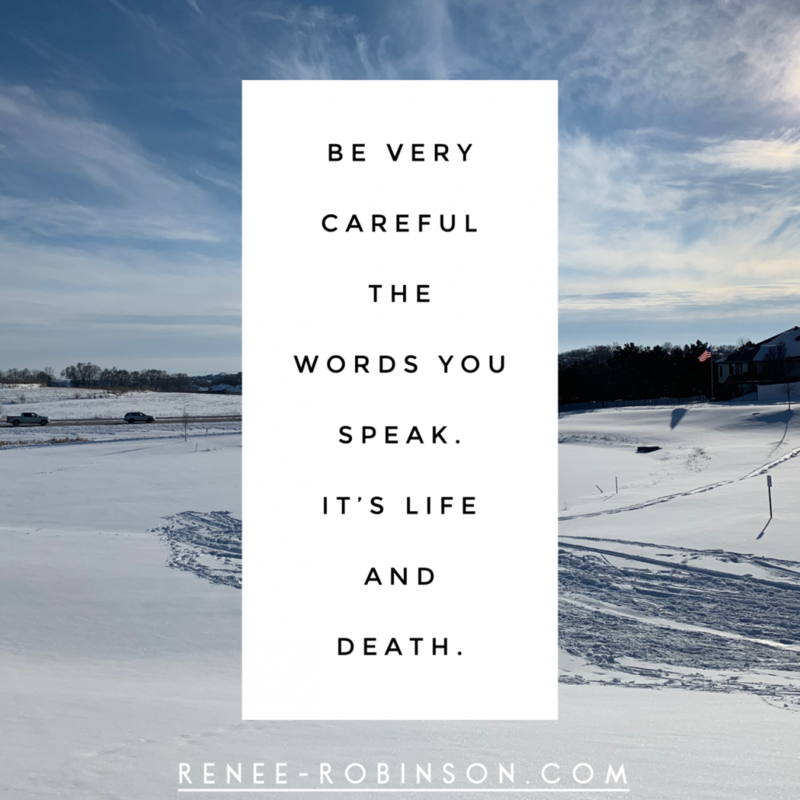 Add Renee Robinson to your address book. What if I like reading better than listening? I had you in mind too, my friend! Each day has a full pdf transcript. Can I buy multiple copies as gifts? Yes, and I hope you do! However, you will need to purchase each copy in a separate transaction. Be sure to to enter the email address for the gift recipient. Quickly after purchasing, send a note letting them know what is coming. I didn’t receive my Day 1 email? Please check your spam, junk, and promotions folders. Some email accounts have multiple junk folders. Also be sure to mark the email as not spam/junk and add Renee Robinson to your address list to help route your emails properly. Will I have forever access to this devotion? Yes, it doesn’t expire. It is yours to keep. Why does it come in 14 emails instead of all in one download? Great question! The answer is simply that I want you to walk slowly with God through this journey. The truths and reminders He will reveal need to be sipped on and soaked in. I’m afraid if I gave it to you all at once, you would attempt to devour it. Slowly digest, my friend. Is it a Bible Study? No, it’s a daily devotional. However, every other day offers scripture meditations and prayers. At the end of these days, I’ve offered some questions for you to ponder if you would like to go deeper with God. Can I get a refund if I don’t like it? I’m confident you will love Illuminate. However, in the event you don’t, I’m happy to offer you a full refund within 14 days of purchase. 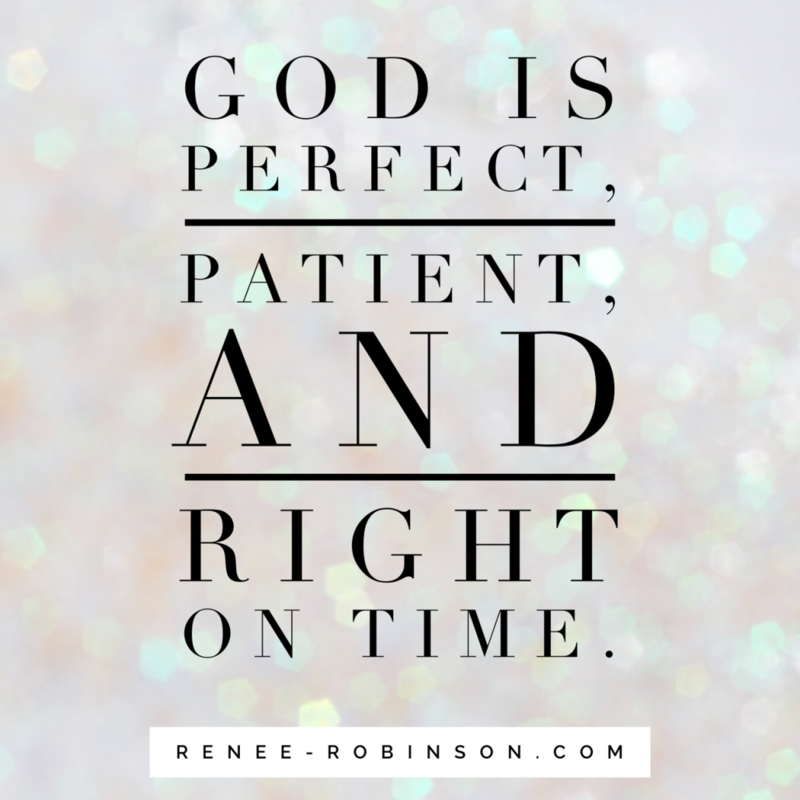 Simply email me at renee@renee-robinson.com. I have questions you didn’t answer. I absolutely LOVE illuminate and want to help you spread the word. Do you offer an affiliate program? At this time I don’t offer an affiliate program. I’m thrilled you want to spread the word. Honestly, the best thing you could do is share with everyone you know. Share on social media, email your friends. Stop by my Instagram or Pinterest pages and grab my graphics and share your heart out! Use #illuminatedevotion. Thank you and I love you! I’m not a woman. Is this for me too? The majority of my readers are women, and illuminate is certainly targeted to women. However, I’ve had several men tell me they loved it! So there ya go! I’ve also had families tell me using it as a family devotion has blessed their family. While I never envisioned that, the Spirit is moving, and your older children may love it as well! I’m still not ready to order. Can you give me more information? You can find a video trailer and all the details you need here. You’ve answered all my questions, and I’m ready to order. Now what? 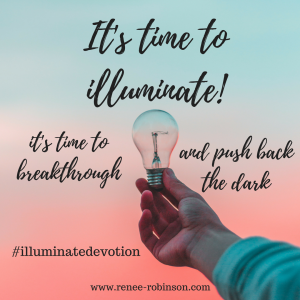 https://renee-robinson.com/wp-content/uploads/2018/03/Are-you-ready-for-a-breakthrough_.png 1080 1080 Renee http://renee-robinson.com/wp-content/uploads/2017/08/ReneeGrey_03.png Renee2018-03-19 05:00:322018-03-21 22:04:54Are you ready for a breakthrough & ready to push back the dark? It's time to illuminate!